well, meanwhile the final physics will be done by deep-strike and Dirk, I can play with the showroom thingy. Ive merged the presentation project template with the common showroom project. player can swith the presentation fly-by cam or manual rotation/zoom cam now. ok guys, the Shorroom ist done. I will make the enduser downloadable pack. the video presents all app features, including skin reloading, car add-on genstring code logic, taking screenshots etc. 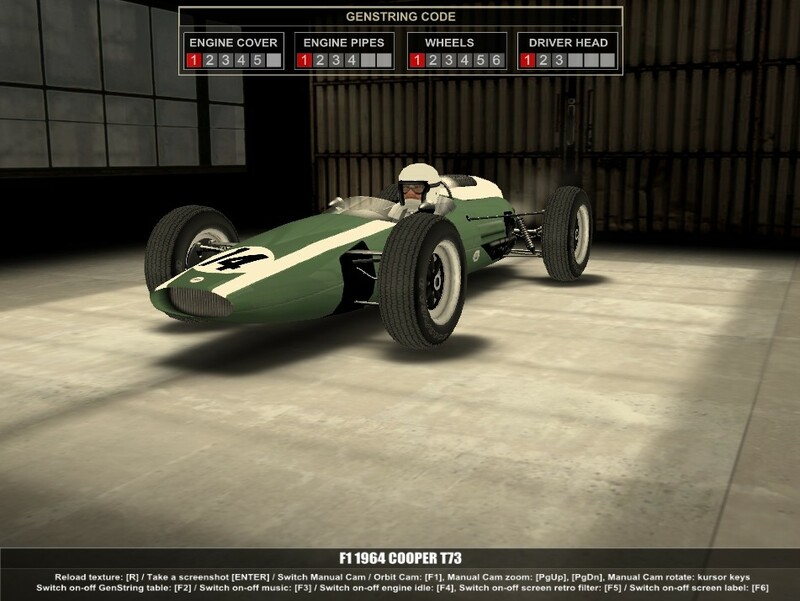 Cooper T73 add-on car is a car add-on for GT Legends, GTR2, Race 07/Race Injection and rFactor race sim games, made by BorekS and team. The showroom application is a virtual garage for car model, you can rotate and zoom the car there. The showroom application, if runs in a window mode, allows to refresh a texture edited in another paint tool. The showroom application is also a genstring code help tool - by switching the code table value the skin maker can immediately see what for current mesh will change. Such genstring codes are used at car-addons. The showroom application runs in a native 1024x768 fixed screen resolution. Just save / overwrite the COOPER_T73_BODY1.DDS in UserCarSkin folder, run the Shworoom tool and hit "R". ... and start the Showroom tool again. We are working on the last subtleties of the Cooper-physics. Dirk and I still need to do a few tests and then the T73 could be released. ok... to all Cooper mod fans: the physics is done (thanks gyus! ), implemented in the final end-user release package and now needs just to check the package by few "chosen" people. 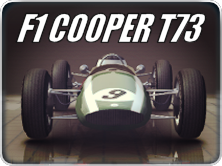 Cooper T73 mod will be available for GT Legends and GTR2 games now. the Race 07/Race Injection should come later - no release date is set. the rFactor conversion is unclear yet, should be in GFraser1965 hands just like the the rF1LR release, but Gil is very busy guy. Thanks for your efforts BorekS!